Whereas many general consumers and tech fans will be wondering of all the potential features Google Glass will be able to harness, the question many developers and security experts will be asking is simply, "can I hack it?" and if so, how easy it is to delve deeper than the surface. Google intern / hacker Liam McLoughlin, who’ll soon have jailbreaking prodigy Comex for company, has been spending a bit of quality time with Glass since Google began releasing early models to developers. Having initially discovered a debug mode within the Glass software that appeared to allow ADB access, he then reported back a couple of minutes later via his Twitter with the joyous news that "[it] looks like root is easy." Although it would be rather naive to try to pinpoint the depths to which Glass could potentially be modded, McLoughlin’s claims that there "is fun to be had" with Glass suggests that, much like the "proper" Android firmware, there’s plenty of potential for hacking. 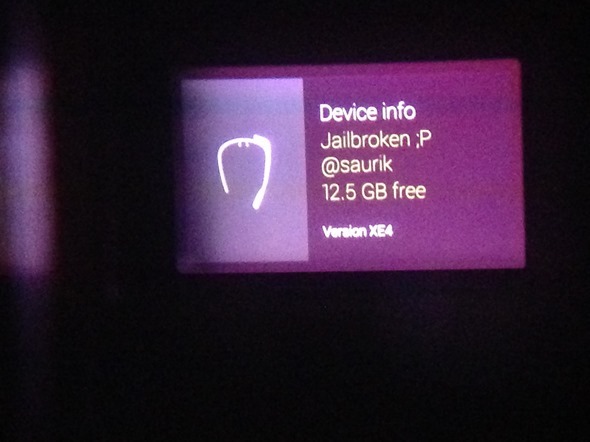 #ifihadglass I would jailbreak it and modify the software (obviously). As Google actually sold me one; I did my part. Naturally, he included a link to a shot of his "jailbroken" headgear, and although the most pivotal member of the iOS jailbreaking scene seems more than happy to dabble in Google products contrary to its predominantly iOS affiliation, he still remains true to his, ahem, roots with the tongue-in-cheek jailbreak gag. So, the take-home here is that Glass will probably be just as hackable as Android, which makes sense given that, well, it is, strictly speaking, running on a variant of the Google mobile OS, version 4.0.4 in its current form, which was confirmed by the company’s CEO Larry page just last week. This isn’t just good news for those that love to hack, but also those that like to see software and hardware pushed to their very limits. Bypassing Glass’ Mirror API will be the key to this occurring with Glass, and even at these early stages, things are looking very promising indeed.